John Black credits his love of flying to three things: his father, growing up in the “Birth Place of Aviation,” and a little airport called Moraine Airpark, just south of Dayton, where he learned to fly. John knew he was destined for the skies after his first airplane ride during the first-ever Dayton Air Show. He learned to fly in a Citabria when he was 17 years old, and he took his first aerobatic lesson in a Super Decathlon before he even had his private license. He received a degree in aircraft engineering technology from Embry-Riddle Aeronautical University in Daytona Beach. While there, he completed the USAF ROTC program. 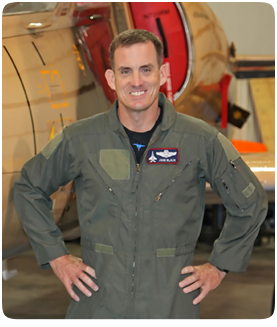 At the beginning of his 21-year career in the Air Force, he flew T-37s and T-38s before being selected to fly the F-15C and F-15A for the Florida Air National Guard. His Air Force assignments have included Tyndall AFB in Florida, Jacksonville IAP in Florida and Kadena AB in Okinawa, Japan. John retired from the Air Force as a Lt. Colonel and amassed 3,600 hours of “Eagle” time as an F-15 Mission Commander, Instructor and Evaluator. After decades of flying jets for the Air Force, John went back to his roots and bought a Super Decathlon in 2002, which he named “Blue.” He began flying air shows in his Decathlon in 2004, and he has performed his aerobatic routine in air shows from Florida to Ohio, his home state. John joined UAT to fly both the TF-51 and the L-39. John has flight experience in over 50 types of aircraft and has flown more than 5,800 hours and 5,100 sorties. He also holds ATP and Flight Instructor certifications.